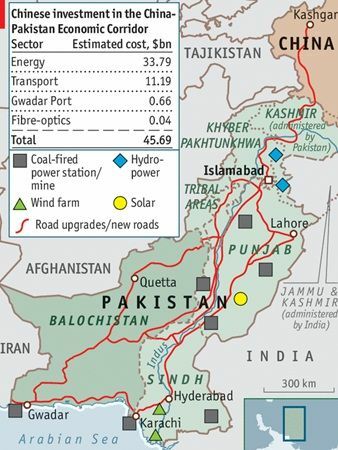 The China-Pakistan Economic Corridor (CPEC) is first proposed by Chinese President Xi Jinping in 2013, along with the Silk Road Economic Belt and the 21st Century Maritime Silk Road. It is aimed at reviving the ancient trade routes that connect Asia to Africa, and Europe. and other infrastructure projects across Pakistan. It will link Kashgar in northwest China's Xinjiang Uygur Autonomous Region and southwest Pakistan's Gwadar Port in its Baluchistan Province. It would shorten the current route from China to the Persian Gulf by more than 10,000 kilometers and instead of 45 days; it would take China ten days to get its imports and exports. It would also help in avoiding any potentially contested Strait of Malacca in Southeast Asia (near Taiwan, Vietnam, the Philippines, Indonesia, and India), and eventually lowering shipping costs. It is providing China an access to the Arabian Sea just about 600 kilometers from the narrow Strait of Hormuz to the west through which passes about 35% of the world's oil shipments. The CPEC seen as a vital bridge in the "all-weather" China-Pakistan relationship. It is opening up new doors of economic opportunities in the region. This 3,000 km megaproject will have significant implications that can alter the dynamics of global politics. The CPEC will help strengthen Pakistan's economy and enhance its position in the region. For China, CPEC will open new routes to the oil-rich Middle East via the Arabian Sea. It will support regional ties and enable the region to stand on its own with minimal reliance on the Western world.